Oh, glorious day (see below for update). is presented in its original aspect ratio of 1.85:1. Black bars at the top and bottom of the screen are normal for this format. Supervised and approved by director Wes Anderson and director of photography Robert Yeoman, this new high-definition digital transfer was scanned on a Spirit 2K datacine from a 35 mm interpositive. Thousands of instances of dirt, debris, and scratches were removed using the MTI Digital Restoration System. 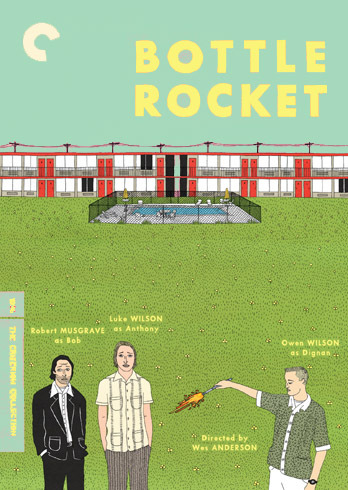 So yes, the artwork for Bottle Rocket was done by me. Eric was unfortunately not involved – I’m a fan of his work as well. Thanks to Ian for responding! He sells his original, affordable art at his website. We hope to have an interview with him posted soon. New friend of the site, we hope? This is awesome! I can’t wait. does this mean eric anderson didn’t do the dvd art work since Ian Dingman is credited for the art? Hi, is it November 09 or 08 ? I think you made a typo. That synopsis is off in a bunch of odd ways. And the cover art–don’t so much mind another naive illustrator doing it–but the color choice is bizarre. They got it right with the big empty field. . . so why is the big empty sky (just as important) pink? Wow — you want the sky colored a minty-toothpaste shade of aquamarine? What’s wrong with pink? Makes sense to me. Wes is always using pink and red in combo. And it certainly jumps out at you a lot more than your “Life Aquatic” color scheme.